Mulberry Burr versus "Stained Burr Maple"
Antique furniture dealers and wood experts have been debating this topic ever since the learned Edward Pinto wrote his article in “Country Life” magazine in 1969, exploding the myth about Mulberry burr furniture which he claimed to be made from “stained burr Maple”. Pinto also went on to state that Mulberry trees seldom produce burrs and if they do, these are likely to be unsound and very uninteresting. He based most of his research on examination of pieces of fine furniture made by the London cabinetmakers, Coxed & Woster who thrived about 1710-1720. These highly skilled craftsmen fashioned mainly cabinets, bureaux and chests in burr wood – which they enriched with the clever use of inlaid pewter lines and cross-bandings of Kingwood and Rosewood. I question how Coxed & Woster obtained all their Maple burrs, because in over 40 years of log buying, I have seldom encountered a good one – especially a heavily marked burr for which the pair were famous. On the other hand, trying to persuade owners to part with their Mulberry trees was a complete waste of time. It seemed that these were so highly prized for their fruit and their beautiful leaves that they were almost given Revered Status ! All that changed on the night of 16th October 1987 when Michael Fish’s renowned Hurricane struck the south of England. Thousands of trees were blown down and hundreds of Mulberry trees were lost. All of a sudden, I was being offered these “untouchables”. Back at our sawmill, the truth could always be uncovered: most of the butts were found to have annular rings showing, on average, 80-100 years of growth. Pinto’s claim that there were seldom good burrs was quickly dispelled ! Beautiful burr grain appeared on every single tree, particularly around the crotch area, and the limbs were covered in burrs. We sent the best butts to Paris to be sliced into veneers, whilst the fine saw blades on the new Woodmizer portable bandmills proved adept at sawing some veneers too. We cut diagonal “oysters” from the limbs and kept a few rougher logs back for turning mementoes for the owners of their trees. So I began to research the use of Mulberry trees for furniture making and remembered Edward Pinto’s old article which I had kept safely. Doubts were creeping into my mind already, but who was I to challenge the mighty man ? I spoke at length to my friend Christopher Claxton-Stevens from the top antique dealers, Norman Adams, and he came to our sawmill (see photo above) to examine and discuss the issue. He saw my point very clearly, but nobody could verify the antique pieces by Coxed & Woster because it would mean removing a piece of veneer for analysis – and not many museums would allow that ! The one thing that was puzzling me was how did the old London cabinetmakers obtain their burr wood? Assuming that I was right about the paucity of Maples with burr figuration, then Mulberry certainly was abundant in the 1700s. King James I had urged everyone to plant Mulberry trees in order to give England a chance to enjoy the benefits of the highly successful silk weaving trade being carried out in France and the Low Countries. 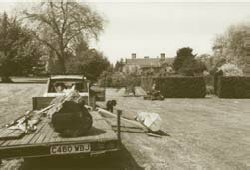 As most historians have long pointed out, the king mistakenly promoted the Black Mulberry instead of Morus Alba, the White Mulberry, (which produces the leaves upon which silk worms thrive) – so our gardens were producing beautiful fruit and excellent timber instead ! But I digress... Where did all that characterful wood come from ? Then I accidentally came across the story by Daniel Defoe of “The Tempest of 1703”.On the night of November 26th, a hurricane of frightening intensity struck, south of a line from Bristol to London. Defoe wrote : “No pen could describe it, nor tongue express it, nor thought conceive it unless by one who was in the extremity of it”. Thousands died and it was the worst disaster for the Royal Navy, losing an entire fleet in that terrible night. So there lay the answer. After the 1703 Tempest, Coxed & Woster set about acquiring windblown Black Mulberry trees. Just like us, some 284 years later, they could not use their carefully sawn butts and wet veneers until they had been slowly seasoned. Eventually, in about 1710, their wonderful burr Mulberry furniture hit the market and stayed popular for about 10 years when their supplies dried up. For the lucky user of Black Mulberry wood nowadays, it is as well to bear in mind that it cuts open to reveal the yellowest wood imaginable. This rapidly turns into a rich, dark brown, upon exposure to sunlight. The wet sapwood contains white sticky latex which can clog the teeth of a fine saw (try pruning a branch on your beloved new Mulberry and you will find out !). Yes, it does make beautiful furniture – although the solid wood components should preferably be made from English Walnut which behaves better and acts as an ideal companion. I commend Mulberry to The House ! P.S. Norman Adams subsequently purchased a Coxed & Woster bureau bookcase and skilfully lifted off a piece of veneer which, under analysis, proved to be one of the Maple family ! But I and countless antique dealers still support my theory – because I have their letters to prove it... but readers’ responses will allow me to reflect my position in the next Journal.